Last year around this time, I began The Seasoned Traveler, not knowing a thing about blogging and uncertain where it might take me. This year-long adventure has been an amazing experience, one that has taught me a lot about food, photography, and writing, and brought me much joy as a creative outlet, but I’ve decided it’s time to travel onward and tend to new (and old) things. Thank you, all of you who supported and followed my cooking trials, let me open my heart up to you and share 150+ varied recipes along the way. All your thoughtful feedback and positive encouragement bolstered me. I send out a special thanks to my fellow bloggers too, particularly Fae at Fae’s Twist & Tango, Suzanne at apuginthekitchen and Angie at The Novice Gardener, who opened up a whole community, a virtual family to me, and continue to inspire me. I have so much more to cook, to learn, and to share, but for now I’ll leave you with one last recipe for the road, one I hope you’ll enjoy. It’s a creamy, saucy, spicy, sweet, fruity, floral, fine dessert in summer, when those small oblong purple plums (pflaumen in German, or Italian plums) are in season. Be good and brave in the kitchen, in life, and throughout your onward travels. To make the ice cream, combine milk and sugar in a large bowl and stir with a wooden spoon until the sugar is dissolved, 2 to 3 minutes. Add the cream, vanilla, and cardamom, and stir again until well blended. Taste for sweetness and stir in more sugar if necessary. Pour the contents into a pre-chilled ice cream maker bowl and churn according to the machine’s instructions, about 25 minutes. Seal and chill the ice cream in the freezer for 2 hours. 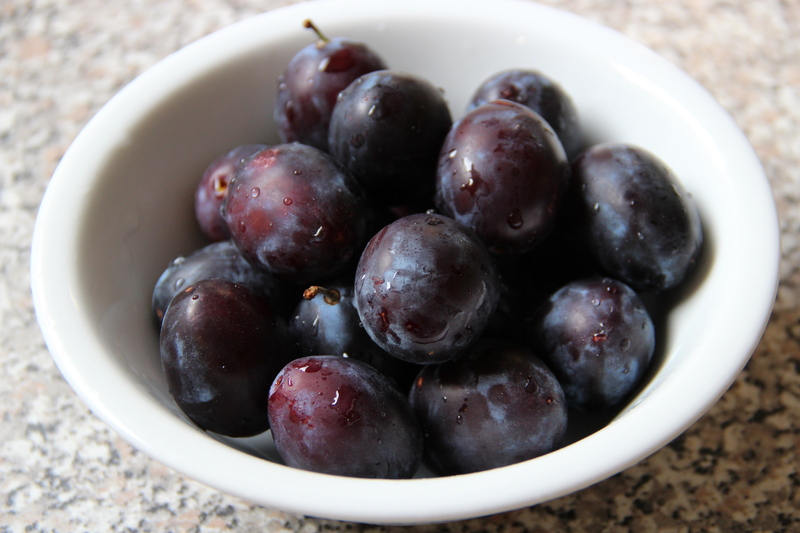 Meanwhile, preheat the oven to 375 F/ 190 C. Cut the plums in half, scoop out the pits, and combine the plum halves with the sugar and lemon juice in a large bowl. Taste and adjust sweetness/tartness to your preference. Grease a small square (8-inch) baking dish with butter and pour the sugared plums in, spreading evenly. Roast, uncovered, for about 30 minutes, or until the plums become tender, jammy, bubbling and syrupy. Remove from the oven and let cool, then add a few drops of rose water to taste, just enough to add a subtle floral touch. 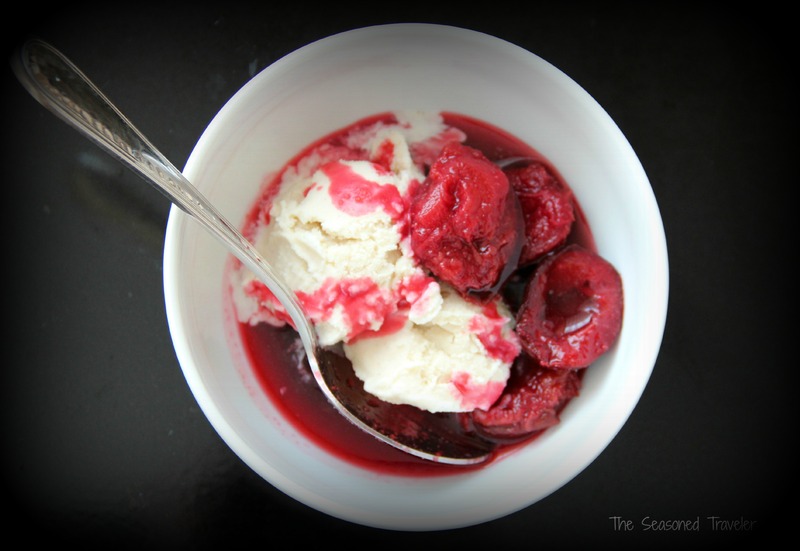 Serve the compote warm or cooled, alongside a scoop or two of the cardamom ice cream. Drizzle more of the plum syrup on top. Enjoy! This sounds like a delicious pairing – cardamom and rose. Yummy! Are you kidding me?? This just sounds like the most amazing combination! Wow! oh can I get some please :)? I love plum! This looks absolutely amazing! Laura さん, ブロッグ やめるの? わたし さびしく なるよ. わたしの e-mail もってる でしょう. たまには れんらく とってね? サンフランシスコ に くるような ことが あったら, あいましょうね? Thank you so much for your kind words. You brought joy to me in the last one year, and your material was exceptional. I learned a lot from you too. Rose, cardamom, ice cream, they are all up my alley. I really should buy an ice-cream maker. 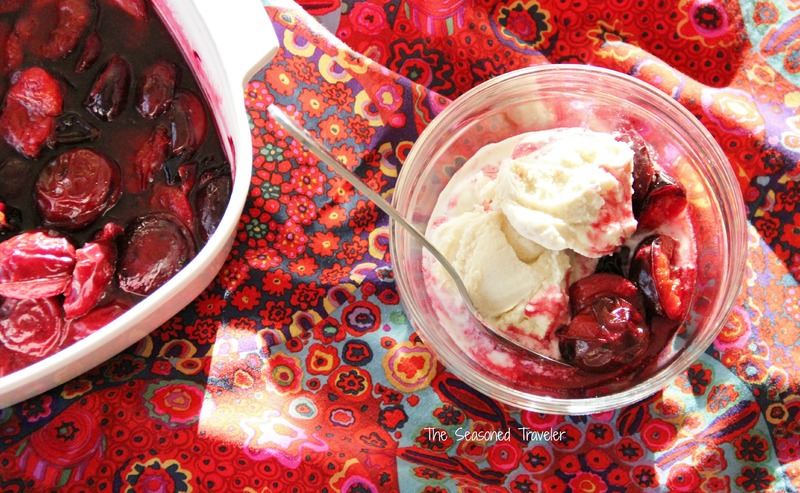 Absolutely wonderful recipe, I love plums, my favorite summer fruit and I love what you have done with them, that photo with the ice cream is so beautiful and makes me want a bowl, I will get some plums this weekend and make this, Laura, congratulations on a year of blogging, I am so glad you do this, you know this is one of my very favorite blogs, the writing, the photo’s the recipes all so well done and delicious, Here is wishing you continued inspiration and many more years of The Seasoned Traveller. This sounds absolutely wonderful. Love the sounds of the cardamom ice cream! I also started just over a year ago, and I absolutely LOVE blogging. The blogging community is absolutely amazing. Such a wonderful family to be a part of! Happy anniversary! All the best to you as you continue your journey, wherever it may lead. May life continue to bring you health, happiness, joy, and peace.